Recognition has come late to Anne Stevenson. Even in 2006 when I reviewed her Bloodaxe Collected Poems for the Times Literary Supplement I noted the paucity of critical writing available about her work. In the intervening years her stock has continued to rise and she has been the recipient of numerous awards. Nonetheless Ian Gordon’s new book is the first monograph to cover her writing in detail from its beginnings to the present. It may be that part of the difficulty in approaching work that is, for the most part, reader-friendly enough is that (like its author) it is hard to fit into any available slot. She keeps a fastidious distance from labels and –isms such as modernism and (for that matter) feminism and nationalism. This makes difficulties for Gordon in his final chapter when he attempts to give a summary characterization of her work. He sees her as the most “transatlantic” poet of the day, but this is little more than to say that any attempt to categorize her as either an American or as a British poet is pointless. There is a certain strain evident when he tells us that her “language is sometimes rich and luxuriant” since he has also to admit that it is “at other times plainer and less exuberant”. He also sees her as “encompassing the differing poles of neo-classic and romantic inheritances”, the first being a matter of craft which is under her control, the second being a matter of revelation which is serendipitous. Certainly in her work there is an openness to experience which she confronts with a dispassionate eye: even the most distressing aspects of that experience (as well as the most joyous) are delineated with a determined formal control. However, when Gordon sees her as “a philosophical poet in the metaphysical tradition” I am tempted to demur, not simply because I am unclear what tradition is thereby indicated but also because not all thinking is philosophical thinking. In fact, she does not associate herself with any philosophical school and, while some of her fellow-poets such as Hughes and Redgrove adhered to some distinctly dodgy occult beliefs, she is admirably clear-headed, putting her trust in science and rationality, and in recent years, particularly in evolutionary theory, rather than invoking white goddesses or shamanistic spirits. When Gordon emphasizes her versatility this may seem to make her amorphous, yet it is in many ways apt. Whereas many poets find a style and more or less stick to it Stevenson is in continual development. Thus there is no such thing as a typical Stevenson poem: when you turn the page of any of her collections you never know what you are going to meet next. She does not so much impose a form on a recalcitrant subject-matter but, rather, lets the subject-matter find its own appropriate form – and its own appropriate music. Stevenson was born in Cambridge, England where her father studied philosophy under G.E. Moore. Children of philosophers do not necessarily follow in their parent’s footsteps: Moore’s son, Nicholas, wrote a sort of poetry that with its startling imagery and wild leaps of imagination was the very opposite of his father’s resolute appeal to common sense. From her philosophical father Stevenson caught, I suggest, a certain tone, a commitment to truth, and a sense that each word counts. Further, he was passionately interested in poetry and music, introducing her to both at the earliest possible age, and learning to play the cello along with his daughter. (Gordon also informs us that, although he is best known for his works on ethics, he also wrote a work on the prosody of English verse.) Musicality is omnipresent in her poetry: she works hard to get the sounds of the language and the rhythms of the verse as right as possible to her exacting ear, often tinkering with previously published poems to that purpose. Indeed, for Stevenson a poem is never quite finished: from book to book the same poem will appear with a different title, sections removed, epithets altered, first person changed to third, all in the interest of the poem itself, from which the poet’s ambition to publish and be successful should be abstracted: for her the poet’s only duty is to get it right. However, this musicality is not at the expense of meaning: Gordon shows her revising a line that sounds good to one less euphonious on the basis of its making better sense. This scrupulous approach to her craft means that she has a keen eye for the bogus. There are, for example, certain passages in Seamus Heaney’s autobiographical writings which evidently have in them more of the blarney than they do of truth, though few critics have cared to say so. Stevenson, however, finds, rightly, that such writing falsifies experience, that it is, in a memorable phrase, “like paint on an egg”.
. But you see the place still stands there, pretty as new.
. they did – and took her with them – and withdrew. Of course, one may have more than one nationality in poetry as in life. Also, as Stevenson would be the first to point out (though it makes for tidy labelling by critics) a poet is not only influenced by other poets, but also by prose, music, by whatever may work on the form and rhythms of a poem.
. Recklessly, untidily into the temporary spring. I wish Gordon had spent more time on her middle-period works such as her verse-novel Correspondences of 1974 with its remarkable assortment of voices, ranging from a nineteenth-century Calvinist minister to a spoilt Southern belle, and which is one of her most impressive achievements – whereas a recent dampish squib such as ‘The Myth of Medea’, of which he makes unnecessarily heavy weather, receives more attention than it deserves. 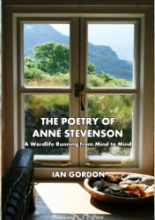 But nonetheless the Stevenson who emerges from Gordon’s book is undoubtedly a major figure in contemporary poetry. He quotes critics such as myself who have stressed the wide-ranging maturity of vision, the crafted nature of her poetry, and the intelligent response to life that marks her work, all of which makes her sound like a George Eliot in verse. Gordon confirms these qualities, of course, but what also emerges is simply how satisfying and enjoyable her writing is in all its varied moods.
. Of being entirely here, yet really not being.
. For all his philosophy and her common sense. This is writing of a genuine integrity and power. She does not always achieve such a mastery of effect, but she achieves it often enough for us to suppose that this is poetry that will last. If, in a hundred years’ time, poetry is still read, it is likely that, though a good many of our contemporary poets will have fallen by the wayside, Anne Stevenson will not be of their number. Ian Gordon’s new book helps to explain why that should be so.